What is bedtime like in your house? For many parents of small children, when the clock rolls around to bedtime, even the best days start to go wrong. And if you have a child who is reluctant at bedtime, it truly does affect the whole household. Preschool-aged children (considered to be in the 3 to 5 years of age group) need about 11 to 13 hours of sleep a day (this can include naps). If your child goes to bed too late, they might not be getting the sleep that they need, leading to a host of other issues, including irritability and sleepiness during the day. And chances are if your child is not sleeping enough, you aren't either, which doesn't help anyone. While some preschoolers are super-cooperative when it is time to lay down under the covers, there are many more who are not so accommodating. And of course, everyone has a bad night once in a while. But bedtime doesn't have to always be a battle. 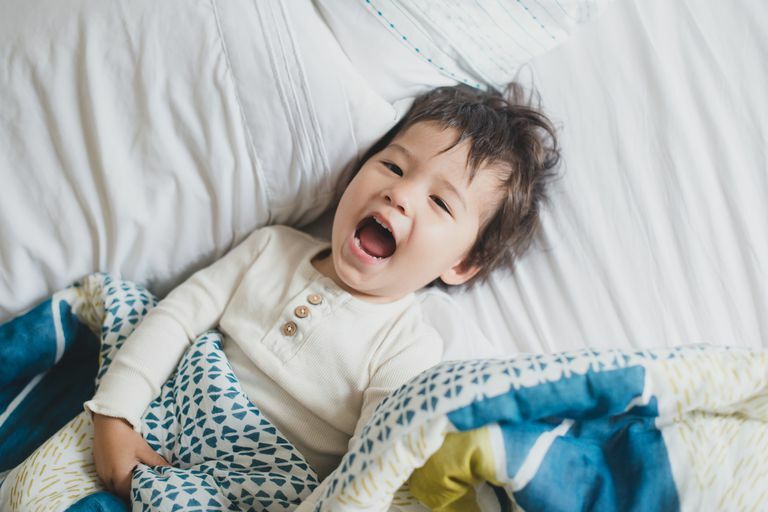 With a few parent-tested and approved tips and tricks, you'll all be sleeping soundly (in your own beds) in no time. Check out these bedtime hacks for a good night's sleep for the whole family. Young children like to be in control, but obviously they need limits as well. So appeal to your child's sense of needing to be in charge by offering up some choices at bedtime. Keep in mind though, when you offer a choice to your child, be sure to offer up options that you will be happy with, no matter what your child chooses. For example, if you ask, how many books at bedtime, don't give the answers as four, five, or six, if you aren't willing to read that many. You don't want to go back on your promise, as that will just cause frustration for everyone. Which book to read before going to bed? How many books to read? Which order to complete their bedtime routine in? Which blanket to sleep with? When getting input from your preschooler, the key word here is choice. Be sure to give a few (or two) options and not leave the question open-ended, because then you will get answers such as "I want to read 100 books!" or "I want to go to bed at midnight!" Whenever daylight savings time rolls around, I have the same battle over and over again with my little one. His bedtime is 7:30. But at 7:30 during the summer months, it isn't even close to being dark outside. So how do I resolve his need to sleep when it looks like nighttime, against my need for him to sleep during actual nighttime? Blackout curtains do a great job of making the room totally dark, whether it is still too light at bedtime or a little too light very early in the morning. Fair warning though: blackout curtains can make the room quite dark, so be sure to have a night light ready if you think the darkness will be too much for your little one. Lavender and chamomile are wonderful when it comes to helping people relax. While using essential oils is heralded by many, you must be careful when applying them to young children. Instead, try products that release the scents into your child's room, including sprays, and diffusers (being very careful to follow all directions). You can also use these scents in the Go Away Spray (see number 5) or in soap or body wash form (see number 8). Weighted blankets have long been heralded by parents of children with special needs as being super-helpful at bedtime. They offer comfort to children who have sensory disorders, who are affected by autism spectrum disorder, or who in other ways have special needs. But others are finding their benefits too. These blankets apply a slight amount of extra pressure across a person's entire body, relaxing the body and induce a feeling of calm. For kids who have nightmares, fears of the dark, or fears of the unknowns in the dark, a little comfort can go a long way. "Go Away Sprays" encourage kids to spray away their worries, whether it is a monster under the bed or an unknown in their closet. They can be purchased, or you can make your own. Simply fill a spay bottle or mister with water and add a scent, whether it is an essential oil, or a perfume or cologne that your child likes. Have the child decorate the bottle any way they choose. Something to consider however: Rather than use a "Go Away Spray," think about using something more positive, such as Brave Potion or Courage Spray. Go Away Spray may actually confirm for your child that there is something in the room to be scared of, while the alternatives empower little ones to be brave. Lullabies have been a go to for parents of babies years, and with good reason. So why not continue the practice as your child gets older? While there is no real medical evidence that they can help a child sleep, they are certainly are soothing and calming and go a long way to setting a relaxed tone at bedtime. Make sure the music is loud enough that your child can hear it, but soft enough so it doesn't interfere with your child falling asleep. A bonus: If you choose the same soundtrack every night, eventually your child will associate that music with bedtime and most likely relax much faster. Yoga before bed can be beneficial to everyone! You don't have to get into a whole, full-blown routine. Simple stretches such as downward dog or cobra will relax kids' muscles and get them into a sleepy state of mind. Play relaxing sounds, such as rain or a waterfall to add to the serene scene. Many people like to bathe or shower in the morning because it helps wake you up. But it can also help you relax before bed. Giving a child a bath or a shower at night has a few purposes: it cleans your child after a long day of running, jumping, climbing, playing, and whatever else that has caused your child to be messy and/or dirty. But, a bath or a shower also stops the day in it's tracks. It's a transition from day to night, from clothing to pajamas (which are also an indicator to your child that it's time to settle down). 9. How About a Little Snuggle? For some children, bedtime is hard because they don't want to separate from mom, dad, or their caregiver. So take some time out to relax together. This should be separate from reading a bedtime story (which also is a great way to help a child wind down!). Turn off all the lights, put away the screens, get under the blankets and just cuddle. You can talk about your day or just sit in (blissful) silence. The one thing to watch out for here is that you don't get into the habit of letting your child fall asleep while you are still there because that can lead to other issues. But still, a few minutes of dark, quiet calm will be beneficial to you both. For kids who need a little extra incentive, consider a reward system of some kind. A positive form of discipline, reward systems are a way of praising good behavior while encouraging it to continue. So, for example, if you have a child who has difficulty staying in bed, you might create a sticker chart (beans in a jar work well too) documenting every night that your child stays in bed without getting up. This really applies for the next day where you can praise your child for a job well done (or talk about what went wrong and how they need to try harder), so it's important that you catch your child not too long after they wake up. Reward systems work best when the praise is immediate. Depending on what type of system you use, you may want to give your child a bigger reward depending on what they accomplish. For example, ten nights in a row where the child stays in bed might equate to a trip to the ice cream shop or a treat from the dollar store.